Busy B Family: A few pictures! I went to the doctor this morning, Chris had to work, so I just went alone. Which was fine because I wasn't expecting them to do anything! Luckily, my friend Em is my nurse at the office, so I can actually enjoy getting to chat while I have all the usual things (blood pressure/weight/bathroom business) done with. 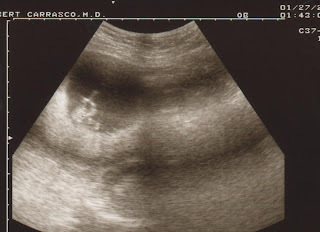 My doc had to go to the hospital for a c-section, so I could wait or she could do my sonogram. She did a few of my exams with Landry so of course I just let her do it! I know these aren't near as good as the previous ones, but their machine is "old school" compared to across the hall, so you don't get as good of a picture. This is the whole body of the baby. He/she's measuring right on track! This one, you can see he/she's legs crossed. This is how Landry would keep his legs in sono pics too! The baby was all over the place, doing flips and moving it's arms and legs really well! It's kinda weird, Landry at this stage would just kinda sit there and not move a whole lot for us. 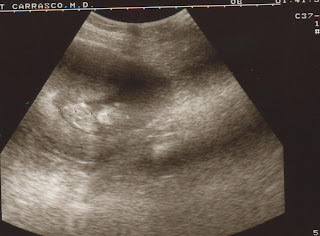 Then as he got bigger, he would hit and kick the sono wand! It may have been pay back from when they had to zap him to get him to move and show us his face! Like I said, it's not much! But very exciting none the less! So far, this pregnancy has been the most complication free than the other 2, so I hope we continue on that road! We look forward to the upcoming months and meeting our baby! Tori, Glad littleone is moving around some. Glad you are enjoying this new baby as it performs for you. The time will go faster this time since you know what to enjoy and how to be ready for HE\She this time. I'm excited to be blessed with greatgrand children. I love you. Hooray for fun appointments! You're lucky to get so many pics of your baby. My doc doesn't like to do sonos. BOOOO! How many weeks until we know if it's a girl or boy? I'm really going to need a ticker up here so I can keep track. lol. If I can perfect my sewing skills, I'll make something fun for the little one. We'll see how that goes. I'm battling with the sewing machine right now. Hope you're still feeling fabulous! How exciting. He/she will be here before you know it. Enjoy your pregnancy. Glad to hear all is going well. Looking forward to more pics. Your mom keeps me updated on your progree but it is still nice to read about it.